The FC Barcelona completes their first challenge of the month. 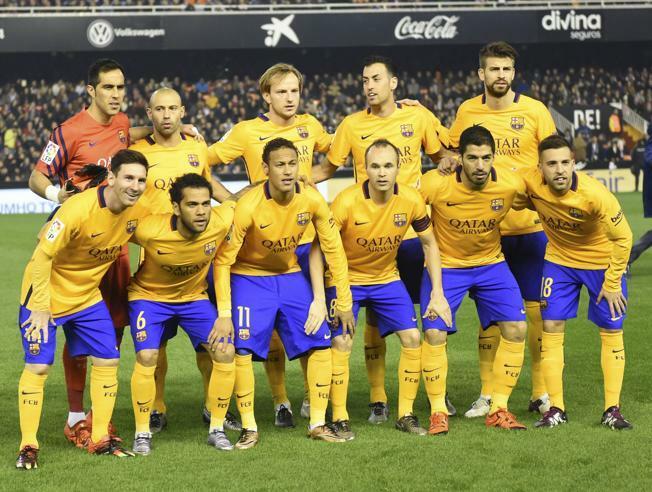 The match against Valencia was held this Saturday (05), at the Mestalla Stadium. After months without losing a game, the azulgrana team finished the game on a 1-1 draw. Their next challenge will be Bayer Leverkusen, on the Champions League. The match started with enough chances for both teams. Just four minutes and Messi throws the ball to Neymar Jr., who dominates and crosses back for the Argentine. The number 10 kicks, but ends up sending it outside. On the next minute, the Brazilian playmaker was face to face with Jaume, but also isolates the ball. Nine minutes and it was Valencia's turn to fight back. Paul reaches from the left and makes the kick with the left foot. Fortunately for Barça, the ball goes up and goes out. After 20 minutes, the match seemed concentrated only in midfield. Valencia did everything to advance, but the Culé team kept the possession of the ball. After 25 minutes, Neymar Jr. made the cut through the right and found Messi in the small area, but the goalkeeper ended up with the ball. 31 minutes into the game, Valencia took advantage of a counterattack to reach the area. In the confusion, Enzo Pérez is overthrown, but the judge does not give the penalty. Barcelona began pressing Valencia, 34 minutes into the game. Messi leaves the ball with Suarez in a counterattack. The Uruguayan crosses towards Neymar Jr., but the ball goes up and goes out again. Up to 40 minutes, Barcelona had several chances to score but the ball did not hit the networks. Without many surprises and with just one extra minute, the first half drew to a close, with the 0-0 draw. The beginning of the second half saw Barça trying a goal on the first two minutes. On the edge of the area, Neymar Jr. gives a nice heel pass to Luis Suarez. The Uruguayan kicked, but the goalkeeper grabbed. The game got tougher and too many fouls hindered its progress. 10 minutes into the game, the teams couldn't find space to complete their submissions. After 13 minutes, Luis Suarez got what he wanted. Lionel Messi tucked the ball for Barça's number 9 , he took it to the area and kicked the ball on the left side, opening the score. After the goal, Barça dominated the match for a while. Valencia could not get near the other area. Despite the second yellow card just coming out after 25 minutes, the amount of faults at the Mestalla was too big, breaking the game. With 28 minutes, Neymar Jr. scared the Valencia crowd. The number 11 came from the left, passing through all the markers and risking a shot from outside the area. The ball passes near the goal and goes outside. 34 minutes and after a failed culé defense, De Paul gets the ball. He took the opportunity to kick, but Claudio Bravo does well and makes the defense. The game was drawing to a close. After 39 minutes, Valencia takes advantage of the counterattack and Bakkali launches to Alcacer. The player dominates on his chest and tackle it to Mina, who score the game at Mestalla. Valencia went to press Barça's defense more and more. In the first of three minutes of extra time, Messi made the last play of the match. The Argentine received from Luis Suarez ,in the edge of the area, made the kick, but Domenech seized, preventing the goal. At 48, the referee whistled, ending the game and confirming the 1-1 result at Mestalla.